This large two story home with redwood siding affords an excellent view of the river from virtually every room, as well as the porch and balcony pictured above. 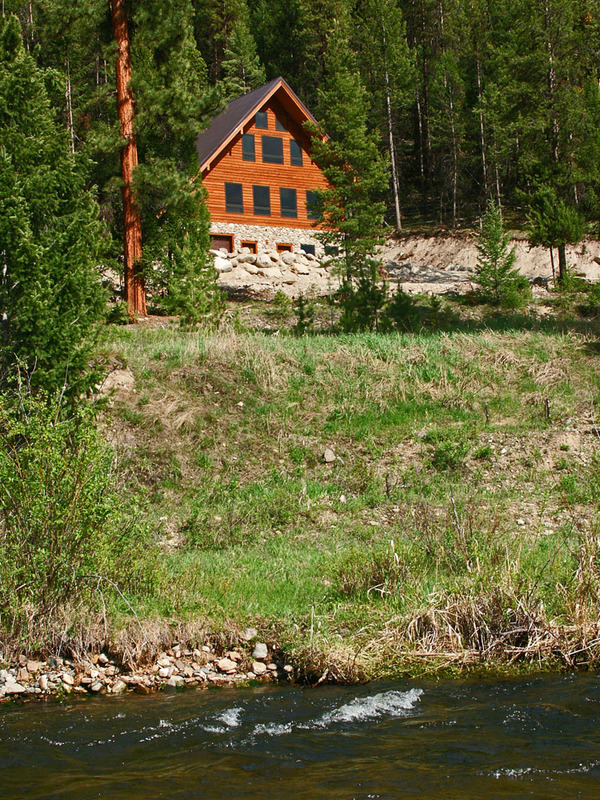 The River Lodge has two master suites upstairs separated by a living room with a stone fireplace, two large windows looking to the river, and a satellite TV connection. 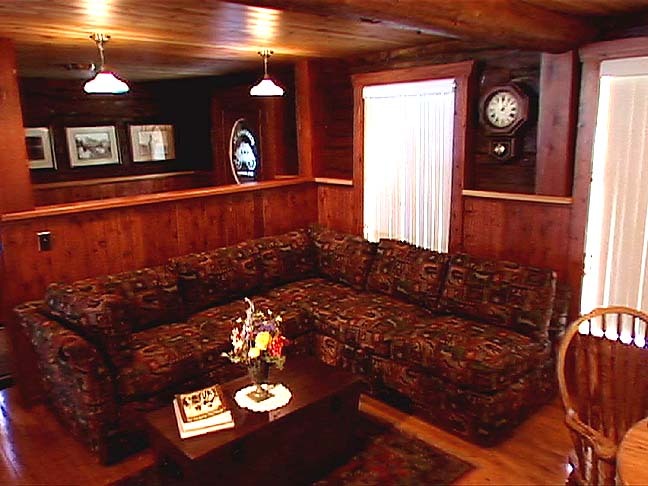 The River Lodge has hardwood flooring and pine paneled walls throughout. The ceilings in the living room and upper stories are vaulted and also covered with pine paneling. Floors in the kitchen and all three bathrooms are of high quality tile. 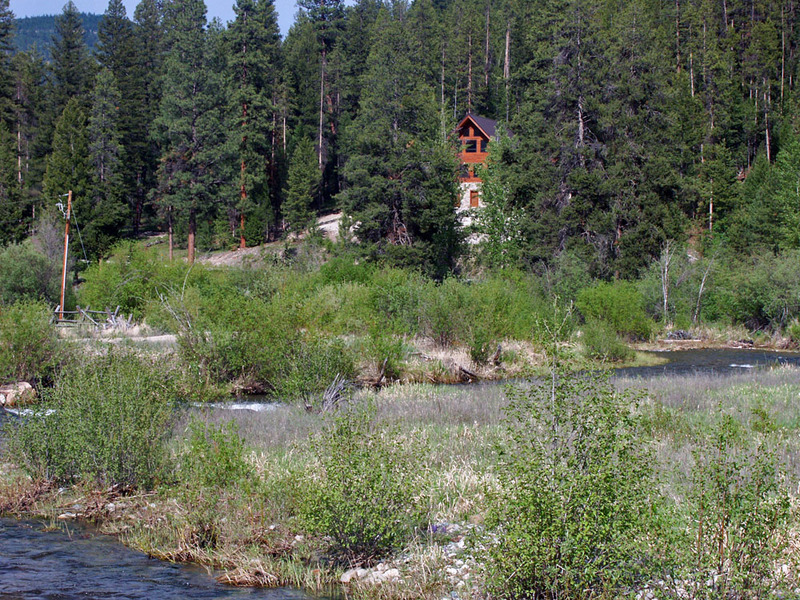 More on the River Lodge. 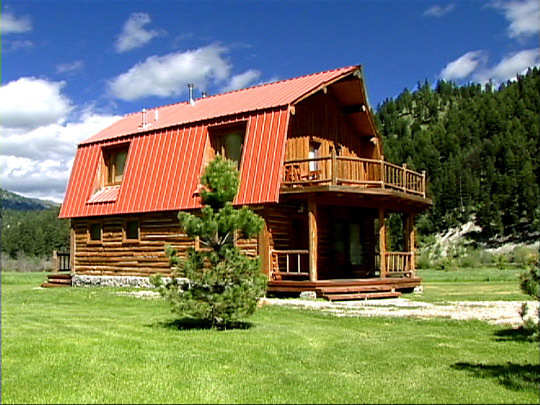 The Ranch House is an original log cabin built by ranchers in the 1940's. It has been renovated with the addition of a large dining/meeting area, greenhouse, and decks. The dining room can accommodate about twenty people. 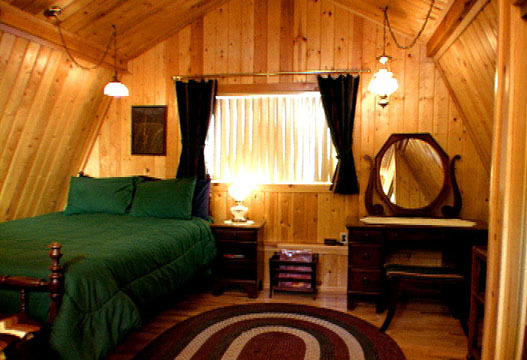 There are four unique bedrooms, two with queen beds, one with a combo king/2 twins, and a full bed in the "antique room". 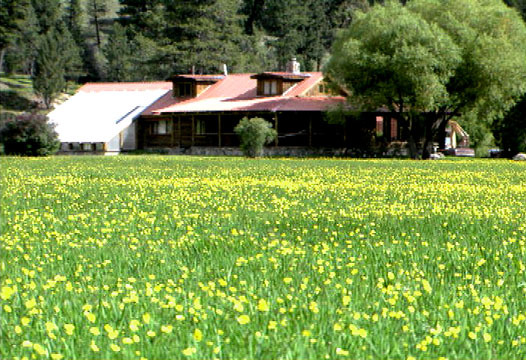 The Ranch House has three bathrooms - all with showers - one with oversized soaking tub with a gorgeous meadow view. The kitchen is fully appointed with a commercial-grade (six burner) gas range, microwave, dishwasher & laundry - with stone hearths in the kitchen and living room. Some of the flooring is original and the rest is antiqued pine to match. 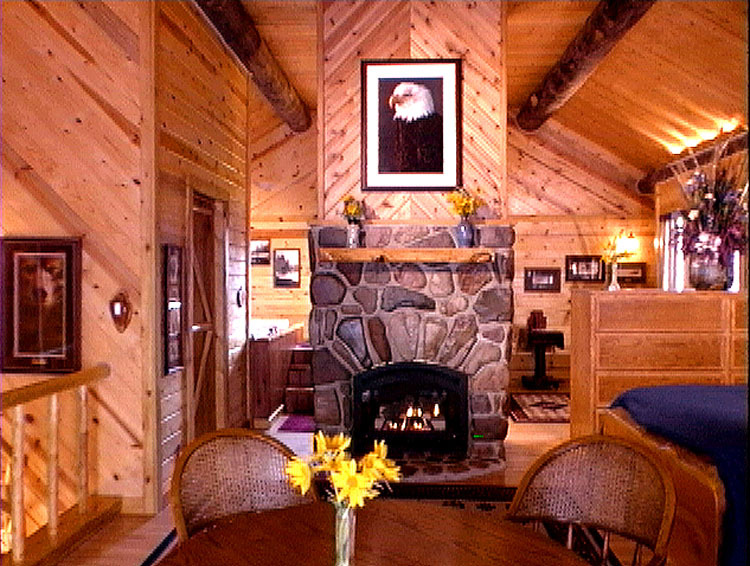 The walls and ceilings are of pine paneling, with the exception of the living room walls which are covered with barn wood. The dining room walls and trim are cedar. 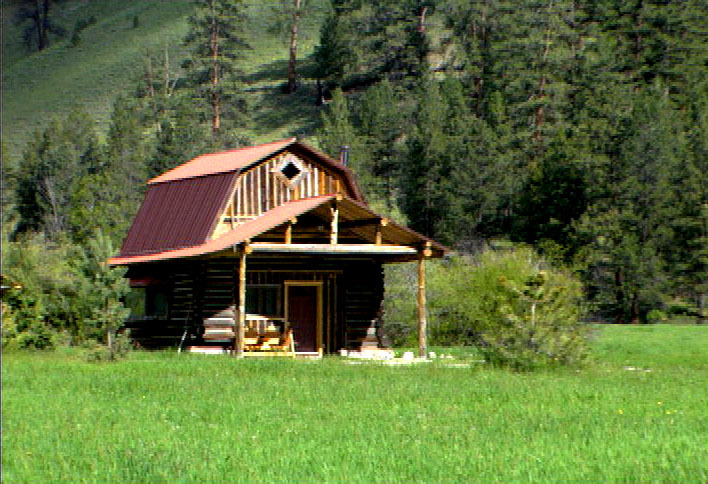 More on the Ranch House. 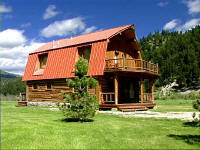 The Homestead is a restored original log cabin - a cozy century-old legacy with charm and modern convenience. It has a generous bedroom suite upstairs with queen bed, sofa & dresser. 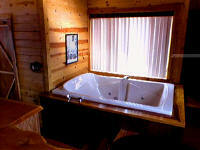 There is a double sofa/bed downstairs - one bathroom with a shower and a view sitting room with a large jetted tub. 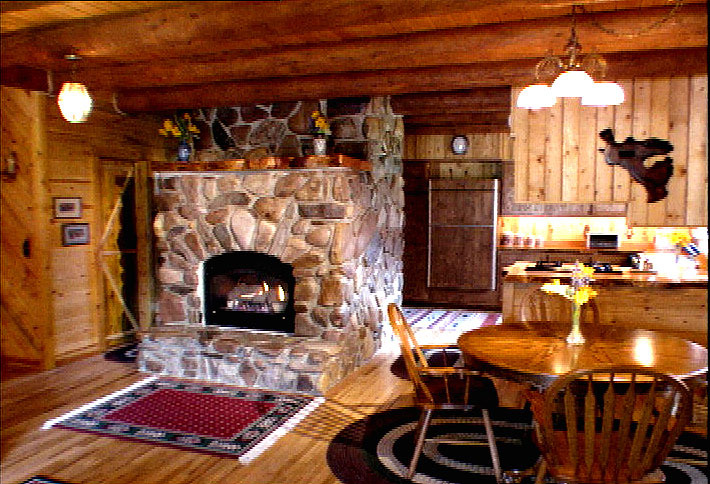 It has a fully appointed kitchen with gas range, microwave, laundry, and stone hearth. 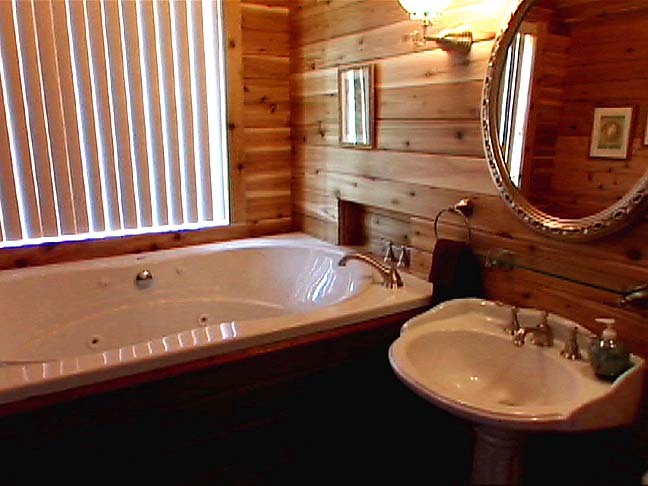 The walls and ceilings are of pine paneling except for the tub room which is of cedar. The Homestead has hardwood flooring throughout. More on the Homestead. 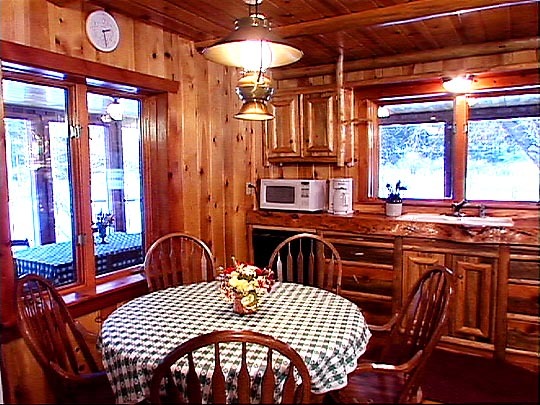 Built in 1910 and recently restored, the "inn" is a two story log cabin with a spacious bedroom suite upstairs - with queen bed, view sitting area, study with a desk and day bed. The adjoining bathroom has an oversized jetted tub with a beautiful ridge view; the downstairs bathroom has a shower. 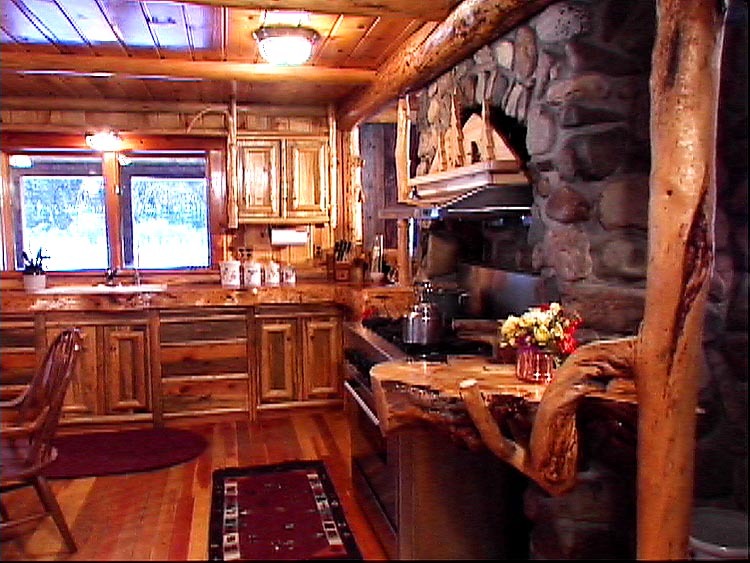 The kitchen appears old fashioned but is fully functional with a gas range, microwave, and dishwasher. There is a laundry, cabinet space and a broom closet in an adjacent utility room. More about the Stagecoach Inn. 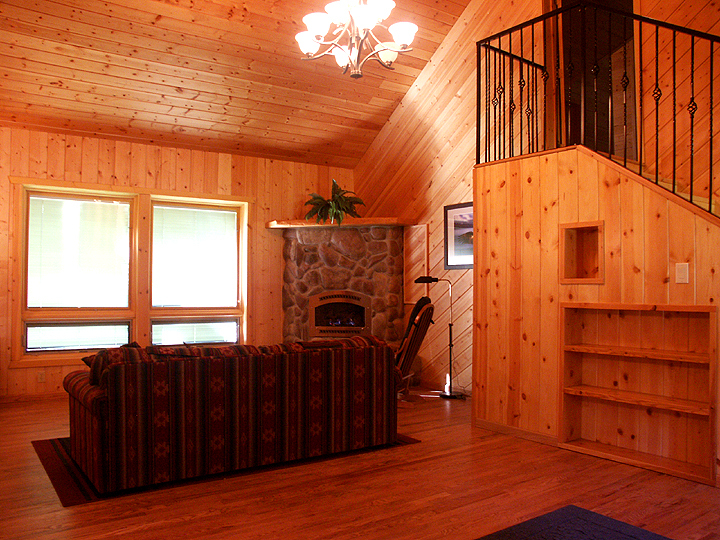 The Barnhouse is a luxurious log home, with a spacious master suite upstairs with queen bed, stone fireplace, deck and adjoining study (with twin sofa bed). 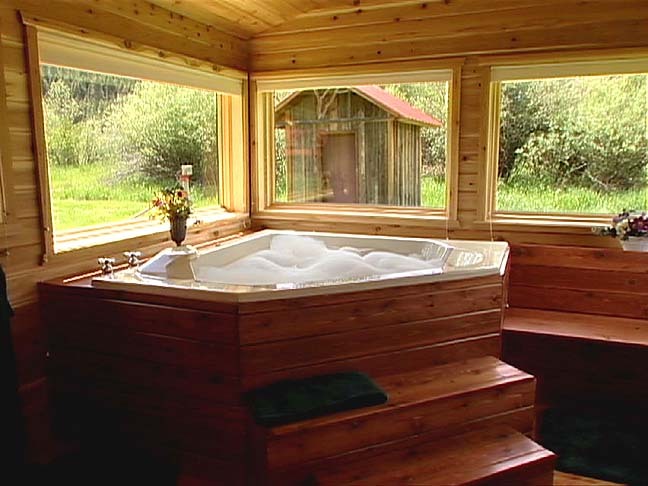 The bathroom upstairs includes a giant jetted tub with a beautiful ridge view. There is a queen sofa/bed and stone fireplace downstairs with a shower in the adjacent bathroom. 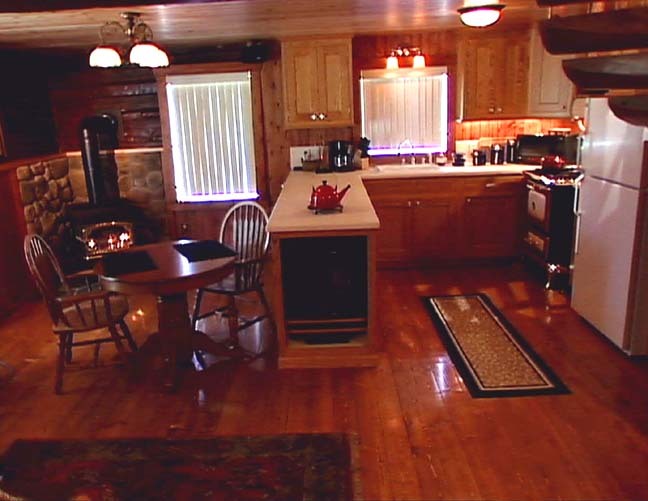 The Barnhouse has a fully appointed kitchen with gas range, dishwasher, microwave, and laundry. The floors are of red oak and the walls and ceilings are covered with pine paneling, with barn wood accents in the living room. More pictures. 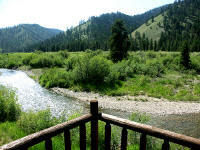 The "Chalet" is a three story building with a commanding view of the river, meadow and mountains to the west. 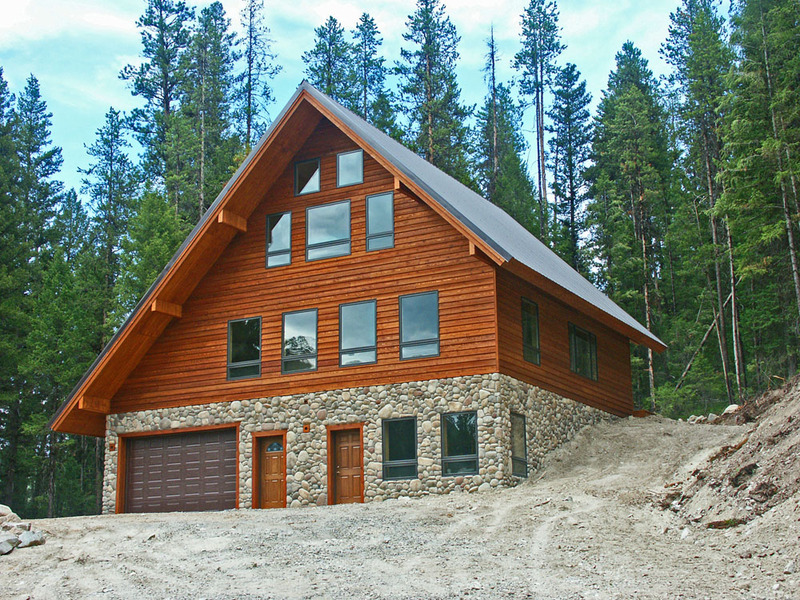 Its exterior is a combination of stone and cedar siding, and pine paneling covers the interior walls. 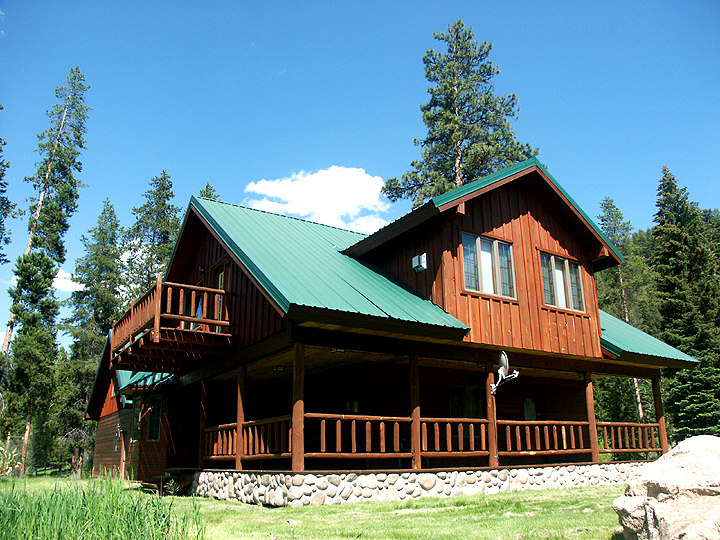 On the east side are two decks - one off the kitchen on the main floor and the other off the bedroom upstairs. 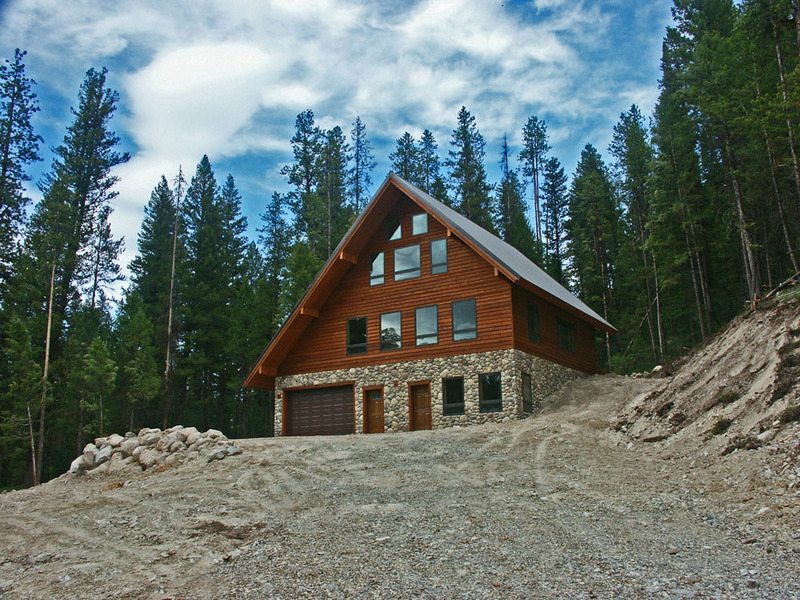 High quality Pella windows have been used throughout the Chalet, many of them with awning windows below and fixed panes above - allowing both superb viewing and ventilation. Windows throughout the home are trimmed with double cell shades, adding to their already substantial insulating quality. Those windows facing west have shades with top down - bottom up capability, allowing continued viewing while providing privacy or blocking the afternoon sun on hot days. The roof is steeply pitched to avoid problems with snow. There are no protruding pipes or vents - all having been brought out through the eaves. 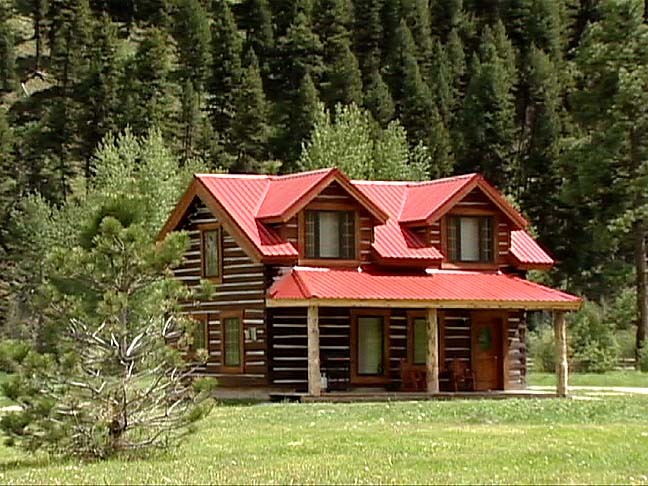 A dark brown metal roof covers sprayed foam insulation giving the roof an R value of 50. Every effort has been made to make this building as comfortable and energy efficient as possible - easy to maintain and a pleasure to own. 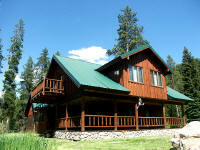 The Chalet practically "takes care of itself", making it an excellent choice for a vacation home. For those interested in Tract D - the Homestead, Stagecoach Inn and Barnhouse - please have a look at a landscaping project there called the "Wild Zones". 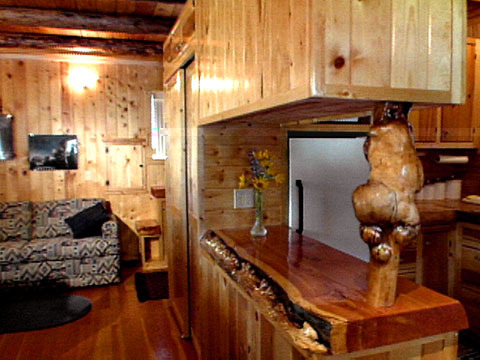 Each cabin that on Tract D has an entertainment center with TV, VCR, & CD player and phone. 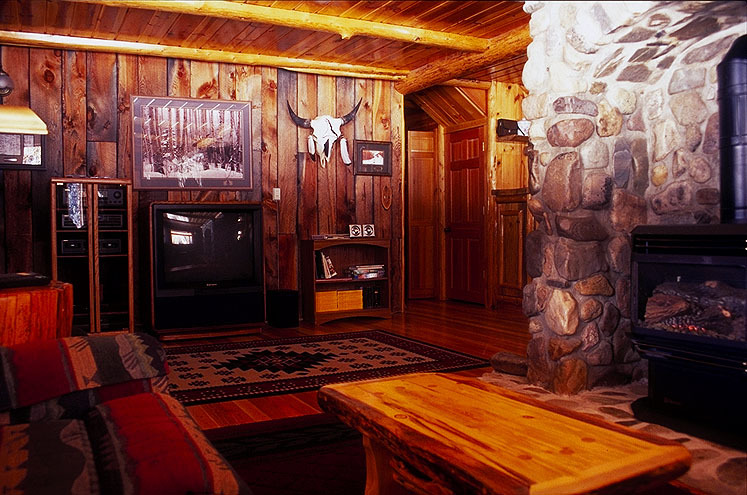 Indoor climate control for all cabins is effortless and attractive with thermostatically regulated gas logs. Each cabin is well insulated, has a very large underground propane tank, and a dedicated electric generator for emergencies. 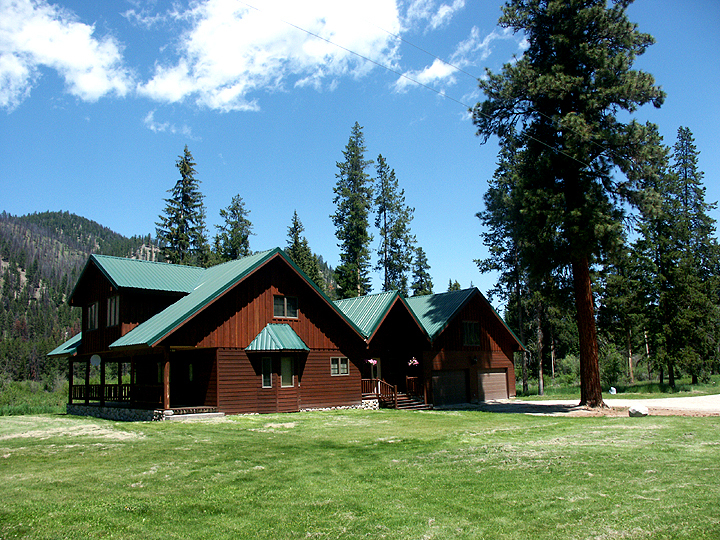 The kitchens at Alta Meadow Ranch are not the usual "vacation home" facility. 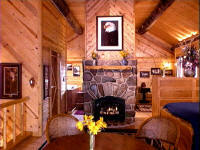 Like the cabins, they are designed and furnished as a home away from home. The nearest 24-hour grocery store is in Hamilton, 50 miles from the ranch (an hour's drive), and the closest restaurants are in the Darby/Sula area. There is a supermarket in Darby that closes at night. The stretch from Darby is 35 miles and is sparsely populated with no services. 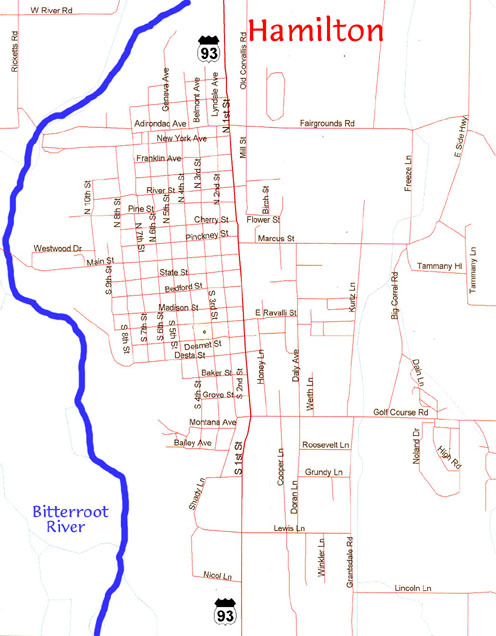 See the Bitterroot Valley map with vendors. No smoking has been permitted inside guest cabins.